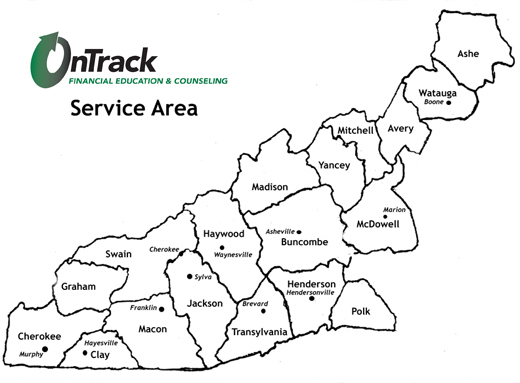 Call our office at 255-5166 (Asheville) or 1-800-737-5485 to schedule an in-person or telephone appointment with one of our certified financial counselors or to sign up for an education class. Appointments are available in our Asheville office on weekdays, evenings, and Saturdays and at satellite offices throughout western NC. Please note our service area is Western North Carolina. Ready for assistance? Click here to get started. Click here to view our education class schedule. Our main office located in Asheville on the second floor of the United Way Building at 50 South French Broad Avenue, Suite 227, Asheville, NC 28801. From the East: Take I-240 west to Asheville. Take exit 4C (Haywood Street/Montford Avenue.). Turn LEFT at traffic light onto Montford Ave. Go over the bridge to the traffic light at dead-end. Turn LEFT onto Haywood St. Turn RIGHT almost immediately onto N. French Broad. Go straight through the next intersection at Patton Avenue (traffic light); the road becomes South French Broad. Turn LEFT into the United Way parking lot. Our offices are on the second floor. From the West or South: Take I-240 east to Asheville. After crossing the French Broad River bridge, take the Patton Avenue exit. Turn RIGHT at the third traffic light, onto South French Broad Avenue. Turn LEFT into the United Way building parking lot. We are on the second floor. From the North: Take US-19/23 south to Asheville. Take the Patton Avenue exit. Follow the traffic flow left onto Patton Ave. Turn RIGHT at the third traffic light, onto South French Broad Avenue. Turn LEFT into the United Way building parking lot. We are on the second floor. From South on US-25: Take US-25 (Hendersonville Road/McDowell Street) towards downtown Asheville. When US-25 turns right onto Southside, continue straight through the traffic light onto Ashland Avenue. Continue north to Hilliard Street (next traffic light), then turn LEFT onto Hilliard Street. Turn RIGHT at the next traffic light onto South French Broad. The first building on the right is the United Way building. We are on the second floor. We maintain satellite offices at the following sites in Western North Carolina. Please call the Asheville office for an appointment. If you schedule an appointment at one of our satellite counseling locations, directions will be provided to you at that time.